New York sneaker designer, and frequent collaborator with Asics and Sebago, Ronnie Fieg has dropped a new apparel collection titled “Volcano”. The CARBON festival alumnus has launched the range exclusively for his streetwear store KITH NYC, but don’t stress the pieces will also be available at the online store. To hype the collection Ronnie has been dropping an extensive preview of the collection via his Instagram feed and even those small detail shots were enough to get any streetwear fiend amped. And from the lookbook images above, it’s clear that the collection is an exercise in streetwear cool done right. Fieg has thought about every detail from head-to-toe, and actioned it in premium fabrics and ample styling. 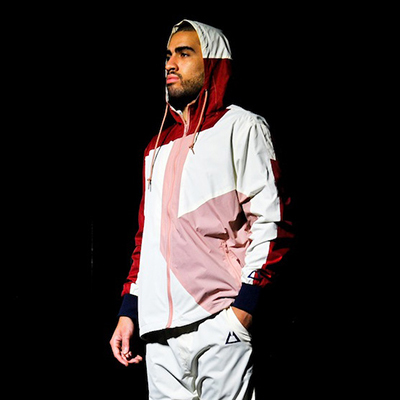 The collection features two tracksuits, a windbreaker and track pant combo, a pair of ‘super invisible’ socks and a pair of KITH x Stance crew socks. Made with water resistant poly fabric and lined with breathable mesh, the set comes in two colour schemes to match the Asics footwear collaboration of the same name. The asymmetrical patterns incorporated into the pieces has that slight ‘hipster’ vibe without going too far into ’80s matching tracksuit territory (which actual hipsters would probably find very appealing). Other thoughtful little additions include some reflective branding on both the tracksuit and socks. Coordinated and covetable. The range is available now via KITH stores or online.